Plenty of Facebook users have been waiting for it, and we had a pretty good feeling it was coming today. That said; Facebook v2.0 is now available for download for both BlackBerry smartphones and the BlackBerry PlayBook. 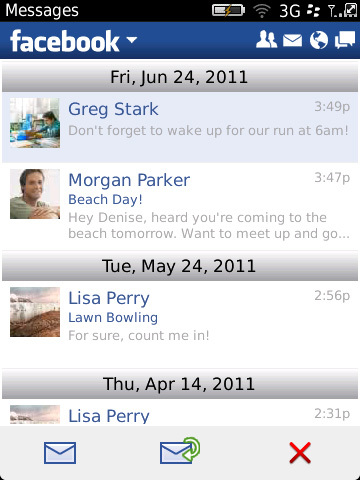 We are pleased to announce the availability of Facebook for BlackBerry PlayBook 2.0 today in BlackBerry App World. Facebook for BlackBerry PlayBook was the first optimized tablet Facebook application that offers users a highly engaging experience with access to popular features such as Facebook chat, video uploading and Places. Also available today in BlackBerry App World, is the official Facebook for BlackBerry smartphones v2.0 app. Thanks to user feedback on the beta, this next generation app includes a sleek new user interface and many new features based on customer feedback, including Facebook Chat. Fire up BlackBerry App World now and grab it -- if you're not seeing it as of yet try refreshing your applications list or sideloading it directly from the BlackBerry App World webstore online.